Woodstock, Vermont is the quintessential New England Village and thriving Vermont resort community where, in 1824, Alvin Adams first established the railroad express line, later to become known as the Railway Express. 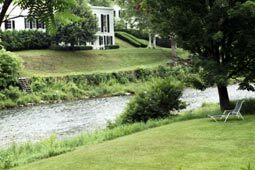 Noted for its natural and man-made beauty, Woodstock is cradled between leafy green hills and the serpentine Ottauquechee River. The question most frequently asked about Woodstock is, "How does one account for the many fine homes when there is no evidence of industry to support them?" The answer is that a mere twenty years after the first settler arrived in 1765, Woodstock became the Shire Town, or seat, of Windsor County. 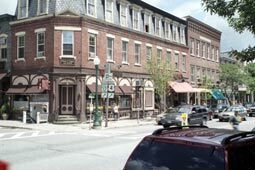 Business and professional people were drawn to the town, and coming largely from Connecticut and Massachusetts, they brought an established culture with them. Families were large, materials cheap and plentiful, and the earliest houses (many of which survive today) were well and amply built. It was then that the Village Green embarked on becoming the showcase of fine Federal homes that it is today. 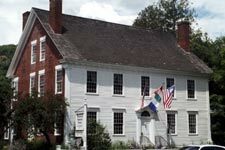 A year-round resort since 1892 when the Woodstock Inn first opened, the Village of Woodstock has thoughtfully preserved its architectural and natural heritage with much of the Village included in a Historic District. Visitors and new residents alike are attracted to Woodstock for a multitude of reasons. Ranked among the top ten are area attractions such as the historic Woodstock Inn & Resort, which in addition to being a reputable lodging and dining venue operates the Country Club's 18-hole golf course, ski-touring center, sports center, and the Suicide Six Ski Area. Other attractions to the area include the Vermont Institute of Natural Science (VINS) with nature trails and a unique Raptor Center, the Billings Farm & Museum, the Marsh-Billings-Rockefeller National Historical Park, the Norman Williams Library, the Woodstock Historical Society, the Recreation Center and Little Theater, the Town Hall where the Pentangle Council on the Arts presents performing arts, and the Green Mountain Horse Association. Among Woodstock's notable citizens. were sculptor Hiram Powers - creator of The Greek Slave sculpture, and Senator Jacob Collamer who served as a confidant to President Abraham Lincoln, and who coined the phrase, "The good people of Woodstock have less incentive than others to yearn for heaven." Another eminent Woodstock figure was John Cotton Dana, the well-known librarian and museum director who first opened the restricted book stacks to the public. More recent residents were actor Otis Skinner and author Sinclair Lewis. Much of Woodstock's historic and environmental preservation can be traced to the dedicated efforts of George Perkins Marsh, Frederick Billings, and Laurance S. Rockefeller. Marsh, the 19th Century Congressman largely responsible for the Smithsonian Institute, was the author of the ecologists' bible, Man and Nature. Billings, builder of the Northern Pacific Railroad, purchased the Marsh homestead and reforested Mt. Tom and Mt. Peg. The Marsh-Billings mansion was later occupied by Billings' granddaughter, Mary Rockefeller, and her husband, who perpetuated the tradition of environmental conservation and the appropriately-scaled commerce which underlies Woodstock's economic vitality and quality of life. Since 1998, their home and surrounding woodlands have been preserved under the ownership of the National Park Service. 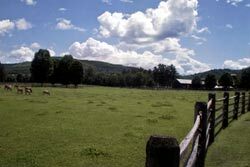 The Marsh-Billings-Rockefeller National Historical Park not only pays tribute to Woodstock, but to the nation's conservation efforts and traditions, as well.